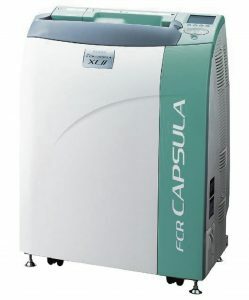 Rapid processing and precise image reading ideal for X-ray images including mammograms Introducing a newly upgraded FCR CAPSULA XL II designed with a new form and equipped with state-of-the-art functions including an optional capability of 50-micron reading with high resolution imaging plates (HR-V and HR-VI). 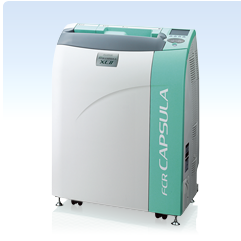 ** for mammography applications in the U.S.A market as “ASPIRE CR FOR MAMMOGRAPHY SYSTEM (CRM)”. The “ASPIRE CR FOR MAMMOGRAPHY SYSTEM (CRM)” is a full-field digital mammography system consisting of the three main components; FCR Capsula XLII (CR-IR 359), Imaging Plate HR-VI and Console (CR-IR 348 CL).